The longer we’re in Jerusalem, more in love I fall with the incredibly varied cuisine here. And like many international cuisines, no matter where the source, traditional recipes are long and labor intensive. I’m making an effort to learn one recipe a week, integrating it into my weekly paleo cook-up. Sometimes, as with a recent experiment with maqluba, I simply say to hell with paleo! Rice doesn’t destroy my guy like wheat products seem to, so I made the traditional recipe as proscribed. Most weekends, though, I weigh how good I feel when I’m eating strictly paleo against trying a new recipe, and frankly, feeling good wins. 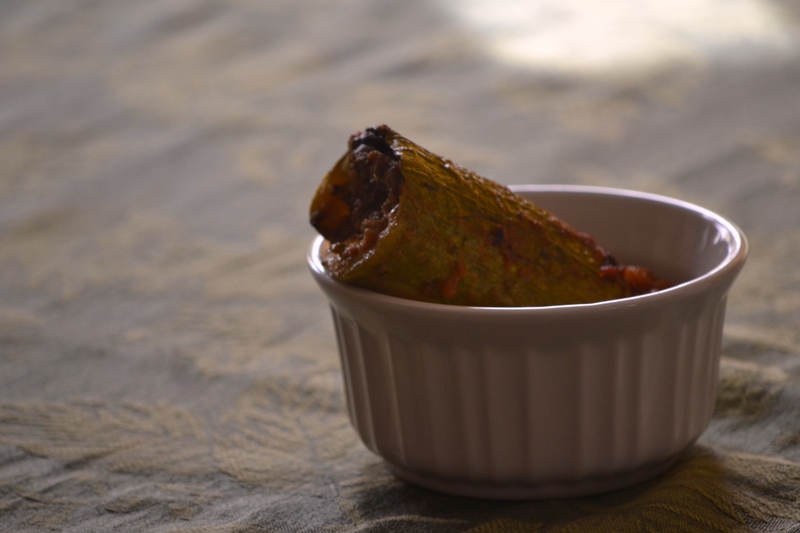 This week, I decided to modify traditional stuffed zucchini in hopes of creating a paleo-friendly version. I read dozens of recipes while trying to figure out this one, but this one was particularly useful (I am not the first blogger who needs paleo middle eastern foods!). I modified the recipe for a larger batch and much more robust flavor. Core your zucchinis. I used large zucchinis chopped in half, and a regular vegetable peeler. I’ve already ordered a regular corer from Amazon. Heat 2T olive oil in a pan, then saute diced onions until slightly soft. Add the ground beef, all spice, cinnamon, and 1t salt, then cook until beef is well browned and remaining liquid has evaporated. Remove beef mix from heat, mix in a separate bowl with two diced tomatoes and chopped parsley, and allow to cool. To make the sauce, puree tomatoes, then heat in a sauce pan with tomato paste, mint, garlic powder, chicken broth, and 1t salt. Cook for at least 30 minutes. While the sauce is cooking, stuff your zucchinis! Smash as much of the beef mixture as you can into the zucchinis, then lay them sideways in a foil lined roasting pan. Add any extra beef to the cooking sauce. Pour the sauce over the zucchinis in your roasting pan, being sure to distribute evenly. Cook for 45 minutes at 400 degrees, turning zucchinis halfway through. Previous Post Join Us for the Awesome Ladies Project this Friday!